Lee Traister’s life took her in many directions before she landed on her homestead in North Carolina. Traister, whose full first name is Liron, served in the Israeli army as a fitness instructor for two years until a whirlwind romance brought her to the United States. For a while, she hoped to ride dressage in the Olympics, but decided she had different dreams: namely, homesteading. Now, she manages a homestead, blogs at Lady Lee’s Home and raises four kids on her own (the same relationship that brought her stateside ended a few years ago, which Traister said has brought its own challenges — and blessings). Traister chats with us about her early life on an agricultural commune, the road trip that changed her life and how she coped with the challenges of life while continuing to manage a homestead. 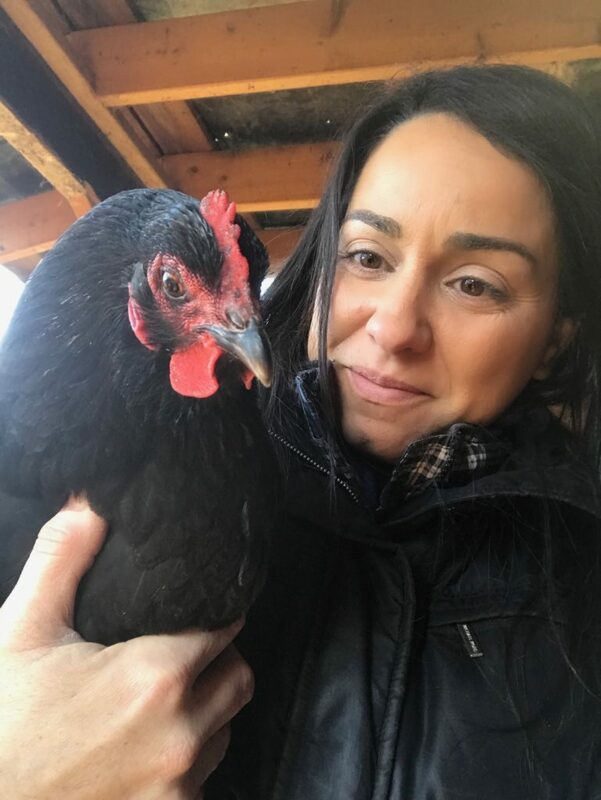 We caught up with Lee to chat for our series, Behind the Homestead Blog, about her road to homesteading and her plans for the future. Hello Homestead: Tell me about your childhood growing up in an agricultural commune in Israel. What did that experience entail? Lee Traister: My parents…are city people and in the early years I was raised in the city. I went to public school and hated it. I didn’t want to go back. My mother saw that I was struggling and decided to look for an alternative form of education. She found a small private school not too far away from where we lived in a community [known as a] kibbutz. A kibbutz is an agricultural commune. Agriculture is the heart of the kibbutz; it’s a way of life. My brother and I were accepted to that tiny private school and looking back, I know on that day our lives were changed forever. The lifestyle clicked for both of us. We felt at home and from that point on we didn’t want to leave. Shortly after I started going to school there I found the barn and the horses and they became my passion. My dad would drop me off early in the morning at the barn. I’d feed the horses and then head to the communal dining room. Our school was part of the village. One class was held in that room and the other in another. We rode our bikes between classes. We’d have woodworking classes, and sewing classes, and nature classes where we would go dig and hunt for worms. HH: What did you learn in the kibbutz that you use on your homestead today? LT: I spent most of my day with animals, so all my animal husbandry skills can be traced to those days. But I think that the most important thing I’ve learned is how freeing this lifestyle is to kids. I remember as a child that I couldn’t stand being closed in a classroom eight hours a day. I needed to be in nature, and I see this in my kids, too. As a child, I had the freedom to explore and observe nature, and I think that it serves me well today. HH: How did you decide to come to the United States? LT: When you grow up in a small country like Israel, the U.S. is this huge dream. It’s the land of opportunity, you can do anything here. I met my husband and he was an American citizen since his dad is an American. It was an easy decision to get married and come here to explore. HH: What did you do for a living before you started homesteading? LT: After we moved to the U.S., I held a few different jobs in retail and babysitting. Part of the reason we moved here was so I could advance in horseback riding, I was riding dressage for many years by then and wanted to take it to the next level. A few months after we moved, I started riding with a trainer that was an Olympic medalist and we moved around with her and the horses from Massachusetts to Florida. At some point, I decided to step away from that life. For a few months I worked in retail until my husband and I started driving an eighteen-wheeler around the country for Fedex Custom Critical. That was a fun experience that allowed us to see America. We lived on the road for two years, traveling 46 states and the east coast of Canada. We spent every weekend in a different state. HH: Why did you decide to settle in North Carolina? LT: We had a small place in Florida since that was where my equestrian job was…but FedEX didn’t have much work in South Florida. We needed a new address for mail and insurance…that would be easy to drive to. We opened the map, looked around and dropped our finger on Raleigh, North Carolina. It was in the middle of the East Coast, not too far from I-95. That’s it, really. It was just a good point on the map. Then we decided that it was time to start a family and settle down. My husband started a locksmith business and I worked with him doing mainly office work. HH: When did you start homesteading? LT: I grew up this way, it was a way of life for me. So even in [Raleigh], I had a garden and a few chickens. I baked bread, made cheese and so on. In 2013, I found 20 acres for sale at a price we could afford [which eventually became our homesteading property]. We bought the farm land, and since that moment, I would escape the city any chance I had. I’d plant stuff at the farm, or just go hang out there. I was always with a few young kids and the land was an hour away, so I couldn’t do it as often as I wanted, but my heart was there. HH: Why did you decide to leave the city? LT: We lived in Raleigh and then Durham. I was there mainly to support my husband. His locksmith business required that he be close to where most people are so he can serve them. Just like back then when I was in first grade, I hated it. I was never a city person. It’s too fast for me, too busy, too noisy, too far away from nature. HH: What was it like making the transition from city life to country life with your four kids? LT: It was like coming home after years in prison. I finally felt like I was able to breathe again. I also clicked with the community right away. These people around me, they speak my language. I remember trying to talk cows with people in the city, they used to look at me like I’d lost my mind. Kids constantly feed of their mother’s energy, so they were flying high, just like I was. They were always very connected to nature. Finally there was more space for them to run around, a pond to explore, a shed full of building supplies and a bunch of animals to mess with. HH: Why and when did you decide to start your blog? LT: I was going nuts in the city and looking for something to do. I’ve always loved writing and I thought that it would be a great way to practice writing in English and a great place to post some pictures for my family from Israel to see. I had no clear direction with it for years. Little by little, I noticed that I was drawn to writing about homesteading mostly. Around 2014 or so, I came across Jill [Winger] at The Prairie Homestead and realized that I can actually make it into a blog that will help others. I wanted to be a part of the homesteading community. LT: The garden was the first thing, then building a place for the chickens, and then the goats. We ended up buying the house across the road from the 20 acres of farmland we owned, which was never lived in and about 85 percent done, so there was a lot of work to do on the house, too. HH: What homesteading projects are you working on now? LT: A smoker is my current building project. I am also redesigning my garden and landscaping around the house. HH: When you want to start a new project but do not have the know-how, what is your process of learning new homesteading skills? LT: For building projects, I have my brother and my dad to consult with. Those two can build just about anything. For gardening and other skills like canning, drying food, cheesemaking, soap making and so on, I turn to Google, blogs, [old homesteading] books and YouTube. I also have a wonderful community out here. There is a welder across the street, a hunter down the driveway, a mechanic a few houses down the road, a carpenter, a farmer a couple of streets over and a few ladies who can show you how to do just about anything in the kitchen. I consult with them constantly, and they help me tremendously. In exchange, I try to feed them as much as I can. HH: You and your husband separated after you started homesteading. What was it like to make that transition on your homestead? LT: I know many people expect for me to say it was hard, but I am going to be honest: it was a great, easy, and smooth transition. Yes, it was scary at times. I don’t have a lot of knowledge with mechanics, so I didn’t know how to handle certain tools, but the community around me stepped in. I got to know people that I didn’t know were there and I got to discover that they have great skills and a willingness to help. HH: What advice would you give to homesteaders going through personal challenges to simultaneously manage emotional stress with daily homestead duties? LT: Every day, when you wake up in the morning you get to choose where your focus is. [If it rains,] you can focus on the mud around the goat house, or the fact that nature gets a much needed drink. You can choose to think about your family as broken, or to appreciate the fact that your kids have two parents who love them and get to try two different ways of living which will allow them to know better what they want for themselves. It takes some work, but I challenge you to deliberately choose to focus on the positive. Train your mind to find the good in any situation. Decide what you want and start moving in tiny steps in that direction while at the same time appreciating where you are and recognizing the value that place holds for you. When you get into that state of mind, things start to change around you. HH: Now, you are managing the farm and raising your four kids on your own. What do you do to take care of yourself when you feel overwhelmed on your homestead? LT: I start my day at 4:30 a.m. with 15 minutes of meditation to clear my mind. I work out at least five days a week and I support my health with doTERRA essential oils. I plan everything. I have this big planner that I call my brain. I try to plan as much as I can a year in advance, and then at the end of every month I go over the next month’s plan, and at the end of every week I go over the next week’s plan. When I feel overwhelmed I drop everything and remind myself to be thankful. I remind myself that everything is always working out for me and that I am not alone. There is a whole universe behind me that is ready to help. Then I look at my list and choose one thing to get done. I get it done, choose another and so on. HH: Do your children help out around the homestead? If so, what tasks do they do? LT: I don’t give my kids chores like many other homesteaders do. Growing up, I could not stand it when I was forced to do something I didn’t want to do. My goal is to inspire them into action not to force them into action. They are homeschooled and they’re here on the homestead with me all the time. This is their place too, not just mine. They can choose how to take care of it. One day they might want to milk the goat, the other they might want to feed the dog, and another day they might decide that they are going to spend time building a roof for their tree house. It’s all good with me. I help them with the things they want to do, and that makes them more than willing to help me if I need their help. LT: I actually wish we will be able to move to Israel soon and build a homestead there near our family. I am waiting to see how this separation and divorce process will end. I would like to replace the small livestock with bigger livestock and go back to cows and horses. I would like to produce more food of the highest quality possible and learn how to preserve it. I would like to keep homeschooling my kids and raising them in this free-range lifestyle. I’ll always homestead. There is no other way of life for me.